Known as "Mama Tsai" by our childhood friends, Nancy was a very CHATTY, quirky, and generous lady. She cooked endless yummy Chinese dishes for our friends when we were growing up and took us to different restaurants almost every weekend. 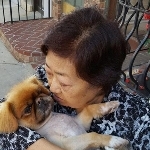 Her favorite hobbies included binge watching Chinese soap operas to the wee hours of the morning, pampering her fur baby Coco, and traveling with her family. Nancy LOVED her daughters, Christina (Bao Bao) and Jennifer (Mimi), and she would often tell everyone how she was so proud of them. However, without a doubt, her favorite "daughter" was Coco. Her beloved Pekingese followed closely behind wherever Nancy went (supermarkets, restaurants, road trips). After having diabetes for many years, several of Nancy's organs started to deteriorate, including her kidneys. This led to a challenging 3+ years of dialysis, which greatly impacted her quality of life. Fortunately, Nancy received a successful kidney transplant in November 2012. Despite initial set-backs post-transplant, she had a second chance of life. Our family is so grateful that her kidney transplant enabled her to enjoy nearly 6 more years of happy memories and share our special milestones. Although she was hospitalized multiple times over the years, her "new" kidney never failed (even to the very end). National Kidney Foundation (NKF) is leading the way in leveraging their knowledge and experience to focus on building awareness, increasing prevention, and improving treatment of kidney disease. Your donation will honor our beloved mother and others affected by kidney disease to receive an opportunity for a second chance of life. Thanks for your support.